I created this canvas to add the color of love to my house for February. I want to share it with you too. Walk with me through the steps to creating an artistic canvas for Valentine decorating. PLEASE READ THROUGH ALL INSTRUCTIONS BEFORE BEGINNING so you will understand the entire process. Step 1: Click on the image below, copy it, and paste it in a file of your own that you can print from. Then print the image and adjust the size for your canvas size. Use tracing paper and trace the heart and Love word on to tracing paper. Step 2: Paint the canvas with Snow White paint using either a foam brush or a larger flat brush. Let dry. Step 3: mix equal parts (1:1) Petal Pink + Snow White paint together. What ever size your paint puddle is, add the same amount of Glazing Medium to it. Working in 2 sections, one at a time, Brush this over the white on the canvas and immediately use the comb and randomly pull stripes through it, revealing the white underneath. Then brush the mix onto the second section and repeat. Let dry. Step 4: mix 3parts Razzle Berry + 1part Snow White together, add a tiny touch of Mississippi Mud to mute or tone the color slightly. Dry-brush technique - using the 1/2 inch flat brush, pick a small amount of this mixed color up in brush and wipe off on to paper towel, brush the residual on to the canvas heavier in some areas and lighter in other areas. This should come off of the brush light causing you to have to somewhat "scrub" the canvas for heavier areas. Be careful not to over do this. Some of the canvas should be darker and warm from this color but other areas should be quite light and untouched by this color. Let dry. Step 5: This step can be messy so cover the area with newspaper or towels first. Pour out some Mississippi Mud paint on to palette and add equal parts of water to it. pick it up in the old toothbrush and using the handle of another brush run the handle over the toothbrush bristles pulling toward you and the paint will spatter away from you on to the canvas. Test this first on to a piece of paper to make sure that the spatter is working correctly. You will get larger looser spots (or blobs) if you have a lot of water in the paint, and you will get smaller specks if you haven't got enough water in the paint. Let dry. Step 6: Repeat the spatter process using Snow White paint. Step 7: Position the heart on the tracing paper on to the canvas where you want it to be. Tape it in place with either magic tape or painters tape. 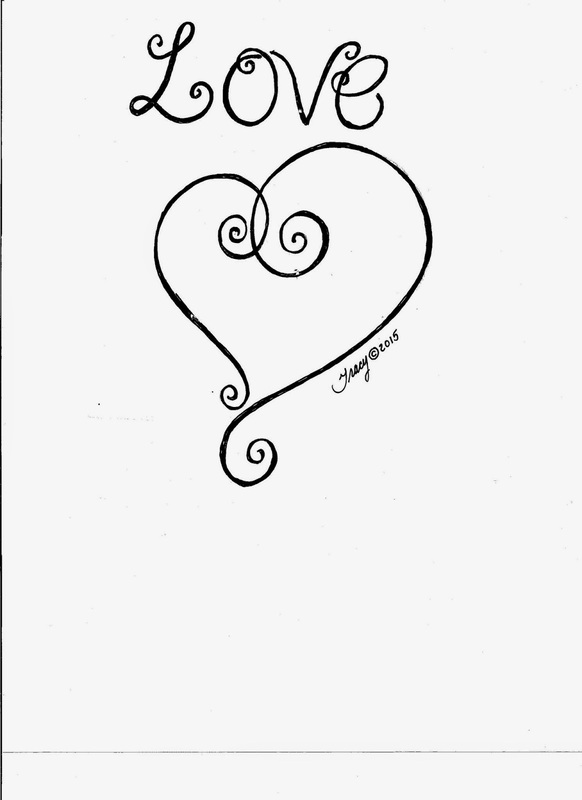 Slip the Graphite transfer paper underneath and trace over the heart design with a really sharp pencil or a stylus tool. Before removing the tracing the paper, look under and check to make sure the design transferred well. If not, go back over it again. Step 8: Using the script liner brush and Snow White paint, paint the heart design. You may need to go over it with a second coat for it to show up well. Step 9: Using the same process for transferring a design, position and transfer the LOVE words. Paint the words using the script liner brush and Mississippi Mud paint. Add a second coat if necessary. When dry go back over the LOVE words with Champagne Gold. Step 10: Using the dark pink mix from step 4 and the dry-brush technique, deepen the color on the edges and corners of the painting. Pick up Mississippi Mud in the brush and with dry-brush technique add some of this color to deepen even more in the corners and edges. Step 11: Use the dry-brush technique and add some Champagne Gold randomly in the corners and various other areas of the design. Step 12: Sign your masterpiece. Step 13: Using the various colors on your palette, paint the sides of the canvas. Step 14: Seal the design with either a brush on Water Based Varnish or a spray clear finish coat. You could paint this on cardstock to create a card for someone special or use fabric paint and do a pillow. Have fun with it!